Deciding on doing a reading challenge for the year, especially one as ambitious as 200 (now 250 of course) prose publications (novels, anthologies), audio dramas and comics, was a huge step back in January. And as you can see from my progress, I’ve been keeping up with the challenge demands fairly consistently and am actually a little bit ahead. Which brings me to this post. Diayll, over at the Mother/Gamer/Writer blog is doing a reading challenge as well, and where hers differs most prominently from mine is that she is hosting it rather than just taking part in one like I am. 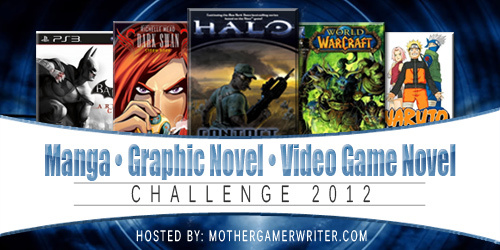 It is a really exciting idea as hers is quite focused on manga, comics and video game novels. You can find the details of the challenge here. Suffice to say that this is a really good fit for me, considering that I’m reading a ton of stuff this year anyway. The benefits of taking part in Diayll’s challenge is the networking aspect of it and just exploring what other people read outside of my (rather) small circle of more mainstream reviewers (not that I’m mainstream by any means, at least not in terms of my exposure to the blogging community). And maybe I could even get into manga this year! Finally!